Well, I'm back in Singapore. I have some cool stories and pictures from Malaysia to post, but they'll have to wait...well, until I set aside some time to organize and post those, along with the cool stories and pictures from Puerto Rico. My sightseeing ambitions for today in Singapore were rather limited. I headed for Sentosa, which is an resort island off the south coast of Singapore, itself an island. I was actually headed for an island off the south coast of Sentosa. This island is, in fact, the southernmost point on the Asian continent. I headed there for three reasons. One, I find extremes interesting. Two, the site is a virtual geocache, and it allowed me to check off Singapore on the geocaching list. The third reason was not apparent to me originally, until I thought -- wait a second, how can this be considered the southernmost point in Asia? Parts of Borneo, definitely in Asia, are south of Singapore. If we're restricting ourselves to "continental Asia", well, this is an island. I finally realized that we were talking about the southernmost point in Asia, reachable by ground transportation. 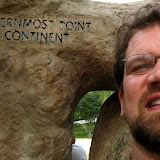 There are more southerly points, but this is the farthest south you can go without getting on a boat or a plane. Then I remembered an article I read several years ago about the prospect of taking a train from Scotland to Singapore. This seemed to me to be a wonderful journey. There are a number of obstacles -- some of the train tracks don't exist yet (see this Asia Times article from earlier this year for an update), and at least a couple of countries aren't the best for an American to travel through. So I decided this trip is one I could take in retirement -- that'll give people plenty of time to build the railroads and, well, achieve world peace. So the third reason is that this is one end of my journey. Maybe some day I'll come back here at the end of that trip. Most likely by then, someone will have built a bridge to an island slightly farther south, though. On a positive note, I got to ride a monorail to Sentosa, and the rain stopped for long enough for me to see the site. On the other hand, it was very muggy, and switching from the train to the monorail required me to navigate through a mall. I decided to head for the Asian Civilisations Museum next, but I got caught in a downpour while trying to walk there from the mass transit station. At this point, my desire to be anywhere but home evaporated, and I headed back to the hotel. Sorry, George, but my trip to get a Singapore Sling will have to wait for some other trip. I showered and changed into whatever clean clothes I could scrounge, and am about to head back to my room to order room service.